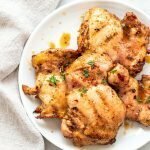 These sweet, sticky & spicy lemon honey glazed chicken thighs are the perfect thing to make when grilling out. Marinate them and brush them with the best glaze while they cook. Remove the chicken thighs from the packaging and place them in a bowl or large plastic bag. Whisk together the olive oil, lemon juice, garlic, salt, Italian seasoning, and crushed red pepper flakes if using. Pour the marinade over the chicken and let it marinate in the fridge for 30 minutes. After 30 minutes, remove the chicken from the fridge and let it come to room temperature while you preheat the grill. If you’re using a wood pellet grill like a Traeger, preheat to high (450F), and if you’re using a gas or charcoal grill turn the grill to medium heat. When the grill is hot, lay the chicken on the grates and quickly close the lid. Grill for 8-12 minutes per side. If you’re using a gas or charcoal grill, check the thighs at 8 minutes. If you’re using a wood pellet grill, let them go for 12 minutes before flipping. While the chicken cooks, whisk together all of the glaze ingredients. Bring the glaze to the grill. Once the chicken has grilled on both sides and is cooked all the way through (165F internally), brush the chicken with the glaze*. Transfer the chicken to a clean plate and serve! You can use bone-in chicken thighs, too. Your cook time will be 5 or so minutes longer, be sure to use a digital read thermometer to make sure the thighs come to 165F internally. The reason we brush the chicken with the honey glaze is that sugars can cause your meat to stick to the grill and create a mess. Brushing the chicken just as it finishes cooking prevents this.